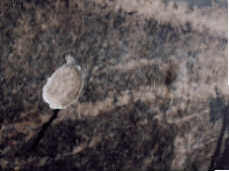 Keel with a "thin coat of algae." Few of us have a bottomless wallet. 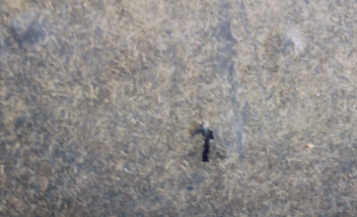 It is always nice to have a firm dollar figure for completion before we issue authorization for a repair. In the case of bottom blistering, this is a challenging task for the most honest and well intentioned repair man. Ideally, the repair man could visit your boat, reach under the waterline, slide his magic fingers over the surface, and blurt out the final price of a perfect repair. Unfortunately, the real world does not work that way. 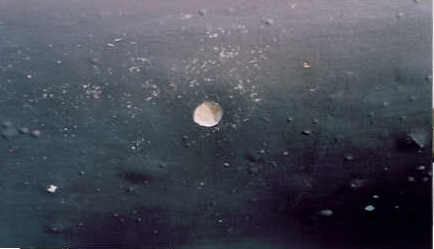 It is nearly impossible to determine the extent of a hull's blistering while the boat is floating. 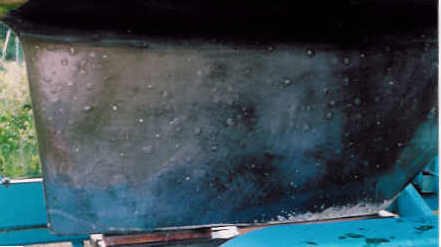 In fact, it is difficult to determine the full extent of blistering in any hull until the algae and bottom paint have been removed. As a boat owner you are faced with a problem. It usually takes months or years to obtain a position in a reputable boatyard's schedule. How can you or the repairman schedule or price blister repairs before anyone knows the extent of the problem? The answer is simple. You can't. Neither can the repairman. The reputable repairman knows that he will be flexing his schedule according to the needs of each boat. When your boat is placed in the work area, the repairman will finally be able to "see what he is getting in to." As the boat is cleaned and some preliminary sanding is done, the repairman will learn exactly what your boat needs. After a few minutes or an hour of inspection, the repairman is ready to make the dreaded phone call. The dreaded phone call is just that for both customer and repairman. The owner is about to learn how much money the beloved boat is about to consume. The owner must sort out that which is diagnosis and proposed care from that which is sales and opportunism. His boat is already in the yard and taking up space. There is pressure to make an instant decision on the basis of limited information. Worse, the information describing need for the allegedly necessary work is coming from someone who will profit from doing the work. The repairman has a reputation to maintain. The boat is already in his workspace. When the boat leaves, the workspace it must properly done and with a satisfied customer. He must sell a good enough job to maintain his reputation for quality workmanship while making certain that the customer "gets what he wants." The purpose of this page is to tell the story of one blistered boat and the evaluation of its condition. The boat was delivered from another lake on a transport trailer. We did not have an opportunity to evaluate the boat in advance. The boat owner had never dealt with us before. Our involvement was based upon three things. The transport driver knew us. We had a hoist that could lift the boat. We had a trailer for ramp launching of the boat. We had fundamentally agreed to unload the boat from the transport trailer, give it a bottom job, and launch the boat in Lake Travis. 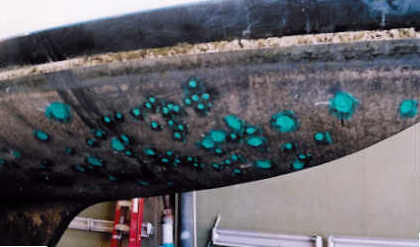 When the boat was delivered it was still covered with a nice thick layer of algae and the owner had no idea that there was a serious blister problem. If we ever write a textbook, the above paragraph will begin the chapter about things to avoid when planning for the "dreaded phone call." The first set of photos were taken during a one hour sampling. Generally $100 per hour will cover both labor and materials during simple blister repairs. In the one hour sample time is lost as each tiny part of the task is accomplished. In the case of blister repair, about 50% is gained by doing each job all at once. Translation: One man spent one hour repairing blisters to see how much he could accomplish with each real work time half hour. All the repairs pictured below were accomplished in about an hour. You can do your own guessing about how long it will take to repair the rest of the boat but we guessed under 10% of the boat had been repaired during our one hour sampling. 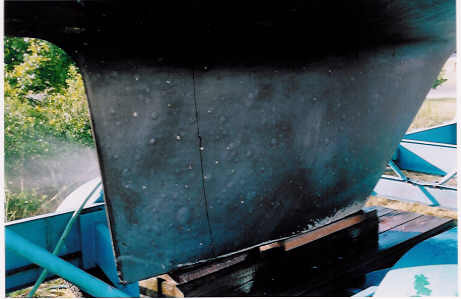 March 2007 edit> Repairs to a 26 to 28 foot boat in the same condition as the one pictured here will consume about $2000 labor and about $300 materials. With the addition of 6.5% Texas sales tax. This repair would add $2449.50 to the price of the bottom job. Boat owners need to understand that blistering is relatively common. 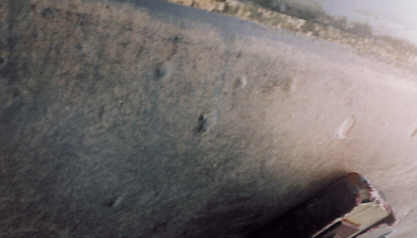 Blistering just like the boat shown on this page is very common on boats built before 1990. If you own a 20 year old sailboat that has been soaking in the water and it has not had extensive blister repair, you should be expecting to find blisters and you should be arranging your budget for that discovery. We have not encountered a brand of 20 year or older sailboats that do not ever develop blisters. 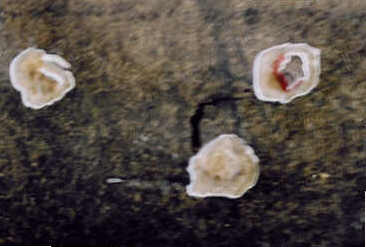 This is a view of three blisters before any routing has been done. This blister has broken and is oozing the nasty stuff from inside. The osmosis has stopped and the blister will not grow any more. Here is the really basic chemistry of blisters lesson. Whatever chemicals are in that nasty stuff make up the solution which is different than the lake water. 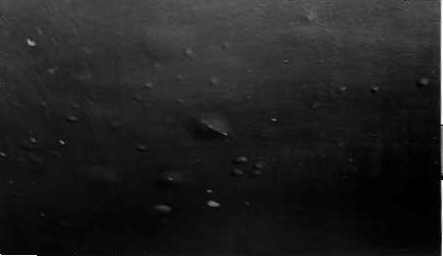 The blister mound you see is the semi-permeable membrane. 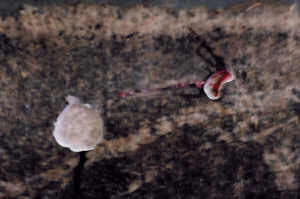 The blister was caused by the transfer of water through the semi-permeable membrane as mother nature tried to balance the composition of the lake and that nasty stuff. 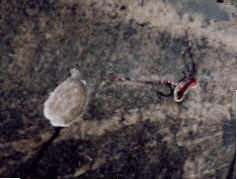 As no lake has ever had as much of that goo per H2O molecule as the inside of the blister, the blister grew until it broke. The repairman doesn't really need to know why or how nasty gooey stuff built up inside the laminate of this hull. All he needs to know is that it happened and it made blisters. Somewhere further down this page we will explain how to fix the blisters that formed in this hull during the last 20 years. The singular most important part anyone must understand is THE NASTY STUFF MUST BE PHYSICALLY REMOVED. 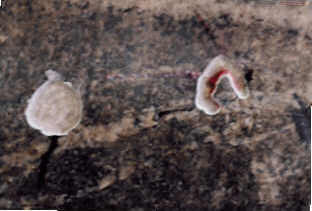 As long as there are voids in the laminate and as long as those voids contain water soluble stuff that won't rinse through the membrane, the blisters can and probably will return. The gooey substance must be physically removed. So, we began to rout away the top surface of the blisters. Each of the three has been started. My tool is a 1/2 inch diameter ball file which is spinning in a tool called a die grinder. The excavation above took about 10 seconds. Notice how we left the center of the top right blister. 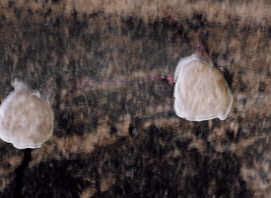 Perhaps you can tell that the inner surface of the other two blisters is also not cleaned. The red halo on the upper right blister is a red epoxy filler that many of us used in the mid eighties. Unfortunately the filler has absorbed water itself and it has grown larger. 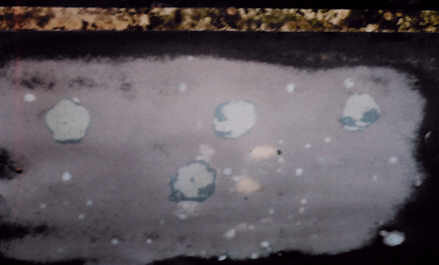 There are a few hundred blisters on this particular hull which were filled with the red epoxy filler and which will have to be repaired again. The filler has expanded and it has broken loose from the laminate. None of us who used the particular brand of filler knew that it would fail. We did not do the 1980s repair on this particular boat but in the mid eighties we also switched from Marine Tex to that red filler and we have re-repaired a lot of boats as a result. Who could blame us? It was easier to mix. It was easier to apply. It was easier to sand. It cost less money. It lasted perfectly for at least a year and sometimes five or ten years. By the time we noticed what was happening, there were hundreds of boats with the red epoxy on their underwater surfaces. As most customers bring their boats back for recoating every two to five years, most shops simply repaired the failing red epoxy repairs for free as part of our expensive education. None of the blisters we have repaired, as described below, with Marine Tex has failed. Some of those repairs have soaked in the warm waters of Lake Travis for as long as 24 years. (80 plus degree from July to September / 54 degree in February.) In 1997 we switched to 3M vinylester blister filler and SO FAR we have had no failures of those repairs. Meanwhile back at this boat>>> We have routed out all three of the blisters and taped a pencil in place to show perspective. The blisters have now been filled with 3M Blister Filler. We tried to fill the blisters as full as possible without overfilling. The blister filler is very hard to sand and we can create a lot nicer and more fair surface by finishing the filling with a thin coat of 3M Vinylester Filler. The blisters have now been filled and smoothed over with the easy to sand filler. The first two repairs have been sanded with 40 grit paper on a dual action sander. 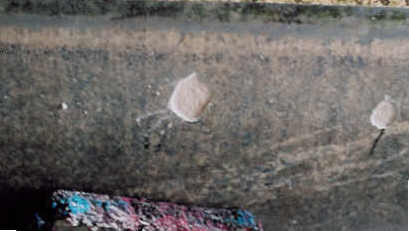 Note the grey material near the repair and the brown bottom paint which is further from the repair. 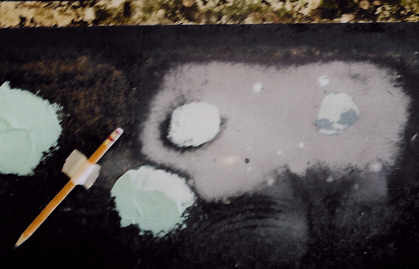 The grey is Interlux 2000 epoxy. This boat has a coating of the 2000 epoxy. 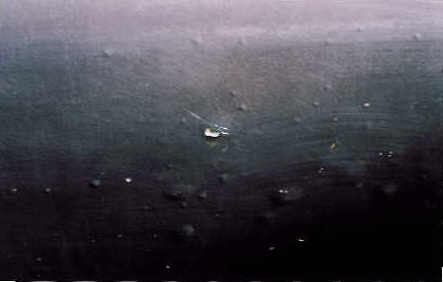 Unfortunately, the coating was applied at about 1/4 the thickness necessary to defend a hull against Texas' warm lakes. If we believe Fred's theories remembered from his high school chemistry classes, we know that chemical reactions happen in about half the time when the temperature goes up about 7 to 10 degrees. If it takes 1 thickness of epoxy to protect a hull in 65 degree water, we believe it takes 2 thicknesses in 75 degree water and four thicknesses in 85 degree water. 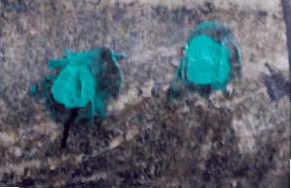 We read and follow the manufacturer's directions for 2000 epoxy protection. As water in New Jersey is much colder than in Texas and the paint company labels come from New Jersey, we assume the directions are about right for New Jersey. We we like to use about four times as much as is specified by the manufacturer. Even if we are wrong to believe this, the only harm is over protection and a relatively minor increase in the overall price of barrier coat application. 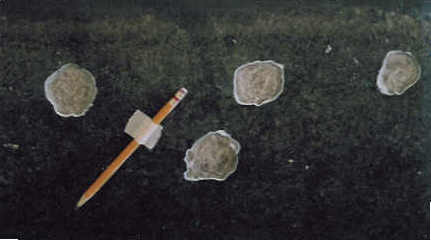 The four blisters are sanded. The following photos are just different angles showing other parts of the boat. Blister and a failing Red epoxy repair to the right. Here we try to show the red a little better. The right blister is fully cleaned except for that little discolored area at the upper right. That area is wet and slightly delaminated. We went back and got the rest before filling the cavity. 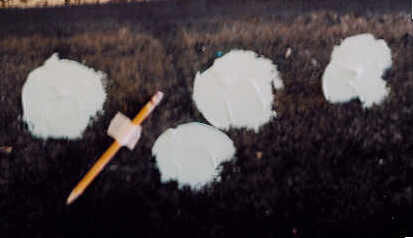 The two holes are filled with 3m Blister filler. 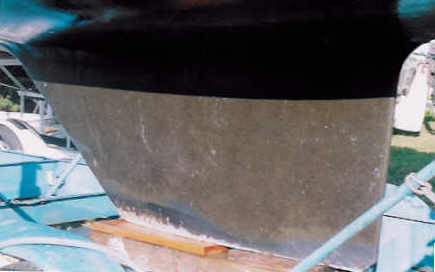 This is a part of the bow. Actually the entire hull has as many blisters per square foot. 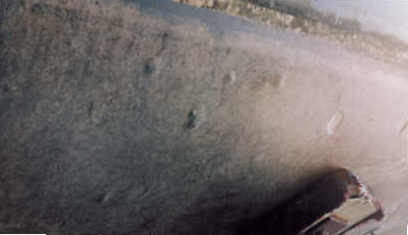 Notice that the hull had not been cleaned when we did these preliminary repairs. More blisters were exposed when we cleaned off all the algae. 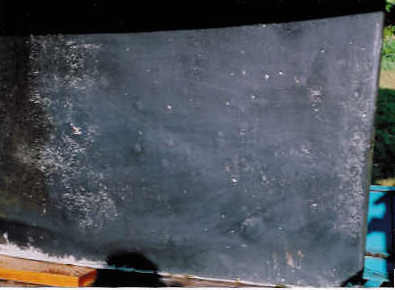 More blisters were also exposed when we sanded the old bottom paint. 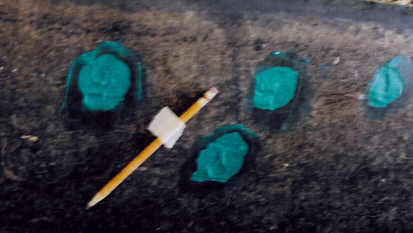 We could find additional blisters by removing the layer of 2000 epoxy. Our suggestion to the boat owner was based upon the fact that this boat has already soaked for 20 years. We believe the best use of funds is to repair all the obvious blisters, apply a thick barrier coat, apply antifoulant and revisit the bottom in a few years. We expect to find 5% to 10% as many blisters in a few years. Those newly visible blisters will be smaller than the typical ones repaired this time. We would simply repair those blisters as part of the next bottom job. With careful filling and sanding, there will be no reason to significantly damage the adjacent epoxy. Ten years from now, this hull will only need to have only a few blisters repaired as a part of each bottom job. We recommend the "get what you can easily find each time" system because it would cost many more dollars to ATTEMPT to find all the blisters in one try. If we were to remove 100% of the old 2000 epoxy and 100% of the gelcoat, and wet the bare laminate, we might find 95% or even 99% of the blisters. We would triple the price of the repairs. We would take the boat out of service for a longer part of the summer. We would still need to repair a few blisters over the next ten years. In other words, we do not believe the extra money spent now would improve the condition or performance of the boat. We do not believe we can significantly decrease the cost of future bottom jobs. We can think of many better things to do with our labor, and the boat owner's money. 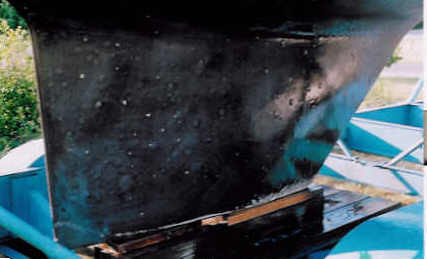 The bow filled with the high strength filler. The bow filled with the softer filler. The keel cleaned and with many blisters exposed. 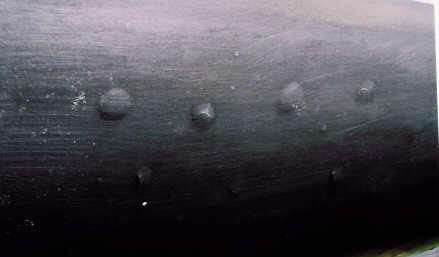 Another view of the blistered keel. 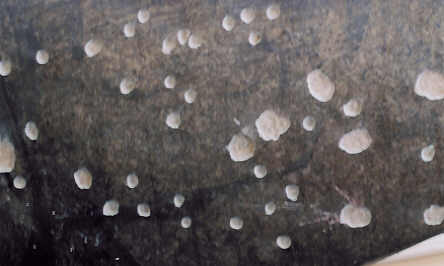 Blisters on the hull. Notice the cracked top on one blister. 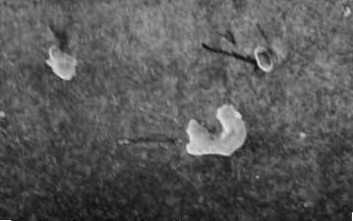 One way to stop blister growth is to break or puncture the blisters. Disclaimer / warning? Don't drill a hole in your hull. Somebody dug at this blister with his trusty pocket knife. More blisters and one burst one. This hole used to have the red epoxy. The epoxy either fell out or that trusty knife was used here. Someday I will revisit this page and make the article come to a better conclusion. Sorry , for now it just drizzles to a stop.